The church was designed by the prominent Dublin ecclesiastical architect, Patrick Byrne. One of Fr Callanan’s curates was Fr Edward McCabe who went on to become Cardinal Archbishop of Dublin. Fr Callanan died in 1846; the headstone of his grave can be seen in the church grounds to this day. His successor as parish priest, Rev Cornelius Rooney (1846-1878), oversaw the building of the present church of the Visitation in Fairview, which was opened in 1855. He was also responsible for the building of a new church in Raheny dedicated to Saint Assam and opened in 1864. In 1879 the Clontarf union of eight parishes was divided in two with the Malahide Road being the dividing line. Fairview, Artane, Glasnevin and Santry now formed one parish, and the parish of Clontarf now consisted of Clontarf, Killester, Coolock and Raheny. 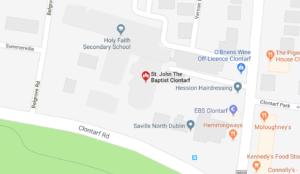 Fr Patrick O’Neill was appointed parish priest of this smaller parish of Clontarf in 1879, and remained parish priest for the next thirty years, until 1909. On September 19, 1890, the sisters of Holy Faith came to Clontarf at the invitation of Fr O’Neill. A local woman, Miss Allingham, who had a cousin in the order, helped the sisters to secure Fr Callanan’s old house to serve as a convent, as the police authorities had moved out of it. In this house they opened a school for girls and a school for junior boys. Her brother, Mr Owison Allingham paid for the enlargement of the church of Saint John the Baptist in 1895, resulting in an addition of seventeen feet at the chancel end of the church. He also donated the high altar, the pulpit, the altar rails, the sacristy, the bell and belfry, together with many new benches. Miss Allingham followed her brother’s lead by decorating the church internally. When Fr O’Neill came to the parish in 1879 he chose to live in number 1 Saint John’s Terrace. He had bought out numbers 1 and 2 Saint John’s Terrace from his private resources and bequeathed them to the parish as residences for the parish priest and curates. They remain the parish presbyteries to this day. At Fr O’Neill’s death in 1909, Clontarf was separated from Coolock, Raheny and Killester and became a separate parish. Fr James Hickey was appointed parish priest (1909–1923) of the now smaller parish of Clontarf. Because of the growing population of Clontarf, the chapel-of-ease of Saint Anthony was opened in 1927, in the building which had served as the town hall of Clontarf down to 1900. In 1956 Saint Gabriel’s church was consecrated as a second chapel-of-ease to the parish church of Saint John the Baptist. In 1966 each of these chapels-of-ease became parish churches in their own right as the parish of Clontarf was divided into three parishes, Saint Anthony’s, Saint John the Baptist’s and Saint Gabriel’s. In the summer of 2009 the three parishes will revert to becoming one parish again. Use the space for ‘comments’ below to add any important information regarding the history of parish. This can help develop the history with the participation of the wider parish community.